There's something comedically ironic about the introduction ceremony of Howard Dean as DNC chair. The funny part has nothing to do with Dean. Take a look at this picture. 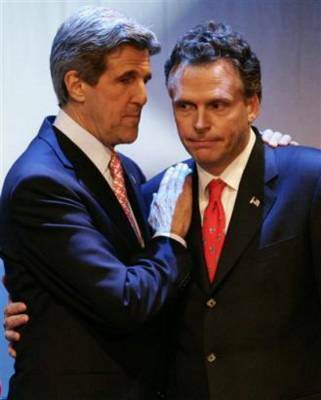 The 2 biggest recent losers in the Democratic party: John Kerry and Terry McAuliffe, hugging it up looking like they're at a funeral. McAuliffe apparently spent a good portion of his exit speech complaining about how it was John Kerry who screwed up the election, not Terry. Of course not, because John Kerry blew all of those Congressional and Senatorial races. I never knew one man could run for so many offices at the same time. Not that Terry will ever read this, but he blew it and he deserves to be out of a job. It was his job to keep the Democrats on message and he didn't do it. If he were capable of holding himself accountable for blowing it, it's quite possible that he'd still have the job or, at the very least, a lot more respect than he's currently getting. Accountability, it's one of the keys to life.